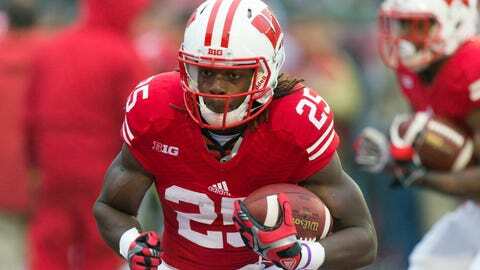 Melvin Gordon has rushed for 1,466 yards (8.1 average) and 12 touchdowns this season. Ending any speculation that he might enter the NFL Draft, Melvin Gordon announced via a statement that he would be returning to Wisconsin for his junior season. As a redshirt sophomore, Gordon was eligible to enter the draft and just recently admitted he would submit his name to the draft advisory board for a grade. But a week and a half before the Badgers are to play in the Capital One Bowl, Gordon made his intentions clear — he’ll be back. "After talking it over with my family and my coaches, I have decided to come back next year," Gordon said in a school release. "I love the University of Wisconsin and feel that there is still a lot of room for growth. Academically, another year in school will help me get closer to completing my degree and on the field I hope to help my team get back the Big Ten championship." Gordon has rushed for 1,466 yards — 11th in the nation — this season on 181 carries with 12 touchdowns. His average of 8.1 yards per rush leads the nation among those with at least 100 carries. Gordon led the nation in 2012 with a 10.0 rushing average. Gordon was a Maxwell Award and Doak Walker Award semifinalist in 2013. However, Gordon likely needs to prove he is a more effective pass blocker and receiver (he only had one reception this season and two in 2012). "I know I’m good at receiving, but they just felt more comfortable with James this year," Gordon said earlier this month. "I really didn’t get to show that. It could affect me if I leave early." Gordon will likely receive most of the carries next season for Wisconsin, which will also be returning Corey Clement. Vonte Jackson also will be trying to make a comeback from another knee injury and the Badgers have a couple of running back recruits, as well. "Melvin is a great player and a great kid and we are very happy with his decision," Wisconsin head coach Gary Andersen said in the release. "We tried to be very supportive throughout the decision-making process and relayed all the information he needed to make an informed decision. I’m glad he can now focus on the bowl game and prepare for a great 2014." Said running backs coach Thomas Hammock a couple of weeks ago: "He’s really just scratching the surface of how good of a player he can be. I see it in practice. He’s getting better. Obviously, he’s had a good season. I think he still has room to improve and room to really take off and be in my opinion the best back in the country. "To me, I think the more football he plays, the more comfortable he’ll become. I know he’s got gaudy numbers and all those things, but he hasn’t played a whole lot of football." Wisconsin will get to see Gordon try to put up even gaudier numbers in a Badgers uniform for at least one more year.